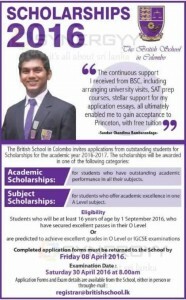 Academic Scholarship: for students who have outstanding academic performance in all their subjects. Subject Scholarship : for student;, who offer academic excellence in one A Level subject. Completed application forms must be returned to the School by Friday 08 April 2016.